The Phillies have signed Ryan Franklin to a one year, 2.6 million dollar deal. Ryan Franklin has been around a little while now (5 seasons) and he's been less than good. He also holds the dubious distinction of being one of the players suspended for steroid use. Last season he was at his worst, going 8-15 with an ERA over 5. Let's see if there's any hope he'll do better next year. 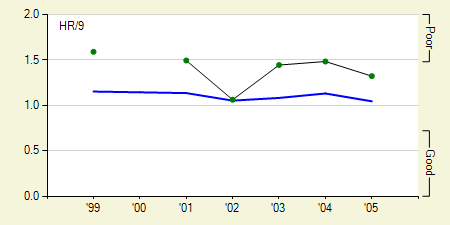 For starters his strikeouts per 9 innings (K/9) are sitting at a pretty bad 4.4. 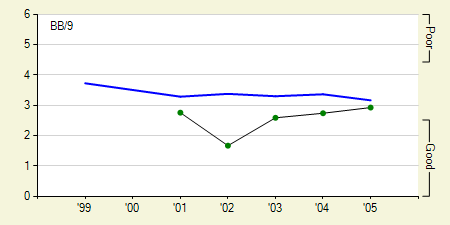 He's only once had his K/9 above 5 and that was in his rookie season when he pitched just under 80 innings. He's gone through various peaks and valleys with his K/9 (never really topping 6 at his best) over the past four years, but I'd say there's nothing here to suggest that he's capable of doing a whole lot better. The only pitchers that can get away with a K/9 this low are the ones that issue very few walks such as Carlos Silva, Jon Garland, and Paul Byrd. Ryan Franklin does not fall into this category. 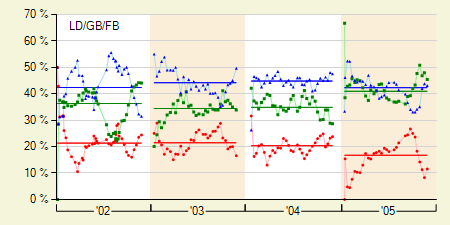 In fact his walks per 9 innings (BB/9) have been heading in the wrong direction the past couple of years. 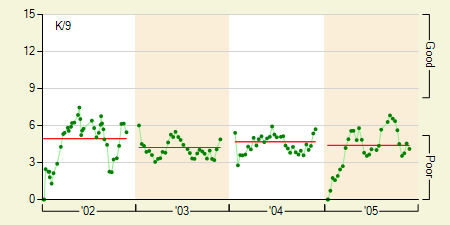 Even if he does manage to reverse the trend, it seems unlikely it will decrease enough for him to be an effective pitcher. Had enough bad news yet? Here's a little more: He's a fly ball pitcher. Seattle's Safeco Field is one of the better parks at limiting home runs. Only 9% of the fly balls are home runs compared to Citizen's Bank Park's 13%. He's never been great at keeping the ball in the park anyway and he won't be any better playing half his games in Philly. I have some additional concerns about his batting average on balls in play (BABIP), but he's historically been below the league average so I'll hold my tongue. Let me just say it would be really scary if he were to ever have an “unlucky” season. If you haven't already guessed, I think you can expect more of the same from Ryan Franklin next season. We hoped you liked reading Daily Graphing – Ryan Franklin by David Appelman! Franklin’s played his entire career in Safeco in front of the Mariners’ stellar outfield defense. His low BABIP is likely caused by that: he’s been pitching in an environment ideally suited to him. Pitching in Philly, if he pitches just as he did in 2005, I’d expect his HR rate to rise by about 45% (just based on the park). I can’t speak to the Phillies’ defense. He is durable (though that might be the steroids). At his best, he’s worth about $2 million a year less than Philly is paying him.